Jaipur : In yet another shocking incident tagged to 'love Jihad', a man was attacked by an axe and then burnt alive Rajasthan's Rajsamand district. The accused has been arrested by the cops. According to an exclusive report by News 18, the accused had made video of the whole incident and then posted it over the social media. 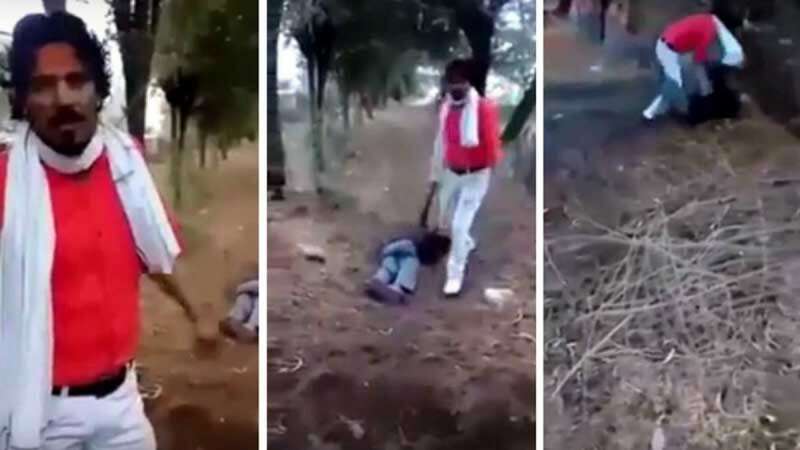 In the video, going viral now, the accused (Shambhu Lal Regar) can be seen beating the victim and then burning him alive. Apart from this he also passed threats on 'love Jihad' standing next to the burning body. Regar was seen saying that those who indulge in 'love jihad' would meet the same fate, said Times Now report. The half-burnt body has been recovered by the cops near a hotel in Rajsamand on Wednesday. The victim has been identified by some as Mohammed Bhatta Sheikh, and his murder weapon is believed to be an axe. However, The Indian Express report said that the police identified the half-charred body as that of Mohammed Afrazul. “During preliminary investigations, we have come to know that one of the videos in which Regar makes the inflammatory statements was shot in a local temple a little while after he murdered Afrazul,” Additional Director-General of Police, crime, Pankaj Kumar Singh was quoted as saying by The Indian Express.